I really hope this nest succeeds this year. We shall wait and see! 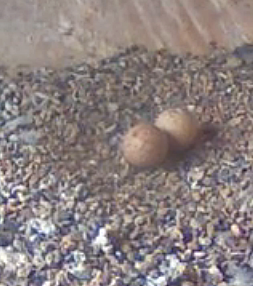 First egg laid today at 11:47 GMT! LOL You beat me to IT, MsPatti... Egg news travels fast! How exciting. The link on the Master Cams List doesn't work for me. Would you please post the link? This is the cam page that I found through Whisper's 'falcon cam project' link up above. scyllabub has been busy recording all the latest events. Thanks sylla! Ahhhh.... the beautiful egg. Funny how excited we get when we see an egg. Egg #2 arrived about 5:00 a.m Sept 6th nest time. 3rd egg laid! Woo Hoo! Video of both parents and the three eggs. The FalconCam Project page has good updates. Oh no! One of the eggs was broken last night. I hope this isn't going to be a repeat of last season. I had noticed earlier in the day that 1 of the eggs looked different from the other two so I'm hoping this was the one that was broken and maybe a dud and the other two will be ok.
She is such a pretty little thing. She doesn't seem to have the sleepy eyed look Michelle gets when sitting on her eggs. The other two eggs are still intact as of this posting. However, she seems to be a bit more focused on one egg and the other one is just "there". Maybe that is my interpretation of what I am watching as she rolls the eggs. No pips in the eggs yet. I looked as hard as I could for the short time the eggs were visible. Is that a dent I see in the egg on the right?? Egg with a large hole in it... and then a hatch!! A fast look at the baby and Swift eating the shell. Thanks for getting this on video!! It's been a long time coming to see the cute phuzzy phalcon at this nest. Based on which egg has hatched (the light colored one), you may have been right in identifying imminent hatchification.